There are currently more than 20 million vehicles in the world running on natural gas. This gas, which is called CNG (Compressed Natural Gas), is the same as the gas used to heat our houses. Natural gas is a resource that is very widely available in the world and is less polluting than petrol or diesel. In Belgium, around a 11,000 cars run already on CNG. A number of manufacturers are stressing this technology, which they consider more promising than electric cars. What’s more, CNG pumps have appeared in over 100 of the country’s service stations. CNG is our ordinary gas, the gas we use for heating. It is compressed between 200 and 300 bars and consists mainly of methane, whereas LPG (Liquid Petroleum Gas) is a blend of propane and butane compressed between 5 and 7 bars. These differences mean that pressurised CNG can be stored as a gas at ambient temperatures. Moreover, unlike LPG, CNG is lighter than air. So vehicles that use this gas are not subject to the ban on access to underground car parks. CNG is stored in gas bottles which are fitted into the car’s chassis. 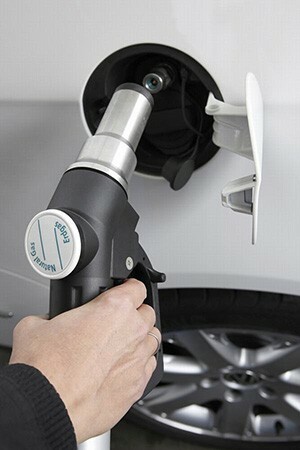 These days, many car manufacturers are offering CNG cars in an increasing range of models. Allow for an additional cost of around €2,000. They usually come with a dual fuel tank. This enables them to switch to petrol if the CNG tank is empty. Depending on the model, you can drive 300 to 800 kilometres on natural gas. The total range of CNG cars with dual fuel tanks can sometimes be over 1,000 km. Conversion of a conventional vehicle is possible, but – depending on the model – may involve a loss of boot space. This is however not done very often and can cost around €4000 to €6000 (not counting tax and other advantages). The number of CNG fuel stations has grown considerably in recent years. Most of them (around 80) are located in Flanders, while Wallonia currently has around twenty and Brussels one. But with the growing success of the CNG car, many new fuel stations will follow. In addition to these, our country also has two L-CNG stations, which distribute both LNG and CNG. LNG stands for Liquefied Natural Gas. To form LNG, natural gas is liquefied by cooling at ambient pressure to -162 °C. This makes the volume 600 times smaller. The range of LNG is about 3.5 times greater than that of CNG on a similar tank content. So that makes it very interesting for trucks and long-distance traffic. LNG can also be reconverted to gas in the fuel station in order to be used to fuel CNG vehicles. This is referred to as L-CNG refuelling. a CNG vehicle can also run on biogas, obtained from the decomposition of organic waste, which increases the environmental benefit. Natural gas is suitable for all the traffic segments: cars, vans, buses, trucks, shipping. Natural gas is transported via the underground transport and distribution network, which could significantly reduce the number of trucks on the roads. (1) Study reviewed by Mobi and Marc Pecqueur (Thomas More) and validated by Ghent University. there is only a limited number of fuel stations supplying CNG. There will be many more in Belgium in the near future. it is possible to convert your present car, but this is quite expensive. This is, incidentally, not done very often. The Government of Flanders offers favourable conditions for CNG cars as regards the annual road tax and the initial registration tax (BIV). The Wallonian distribution network managers, Ores and Resa, provide an incentive discount for every private individual living in Wallonia when purchasing a CNG car. The usual inspection of the car (first after 4 years and then annually) must be carried out by a GOCA inspection centre. This is the same procedure as for diesel and petrol cars. During the vehicle inspection, a brief CNG check (leak detection) will take place. In addition, there is a 4-yearly inspection of the CNG tank. At the moment, only a few companies are authorized to do this (further information available from your fitter or garage). More and more automotive fitters/mechanics are following the Educam training. Eventually, therefore, the specialist dealers themselves will be authorized to carry out these checks. More information on natural gas-fueled cars is available here.